Sat 9 March, 4-5.30pm. AED 200. InterContinental Dubai, Festival City. I can see I’m going to be busy over the next few weeks getting my tips lined up! But when I look back over the last five years, from winning the 2013 Montegrappa Writing prize as an unpublished author, to today, when I’ve four novels out in the shops and have just submitted my fifth manuscript to my editor, I realise how much I’ve learned. 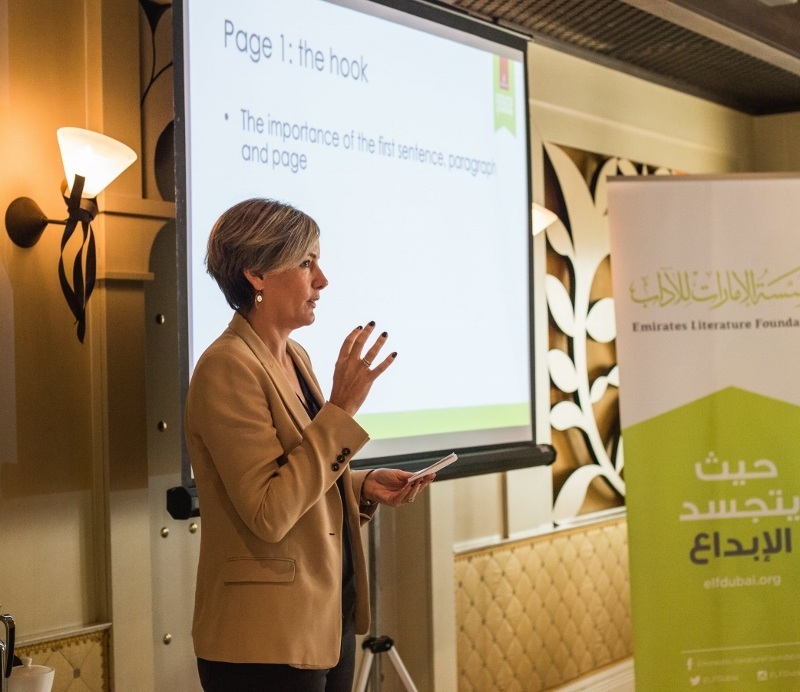 Before I won my publishing contract, I attended as many Masterclasses at the EAFOL as I could: Greg Mosse, Mark Billingham, Marina Lewycka, Tony Parsons, Louise Doughty, Alexander McCall-Smith and Peter James to name a few. I learned that every author has a different style of writing and a different approach to writing a novel, and I learned something valuable from each and every one of those authors. Since publication, I’ve learned even more about writing through working with the talented editors at my publisher, HQ Stories, and with my agent, Luigi Bonomi, who has an uncanny ability to cast an eye over a synopsis and tell me in a sentence exactly what’s wrong with it. I can’t get you published, but I hope my masterclass will push you a little further along the road toward finishing your novel, getting it in shape for submitting, or even to winning an agent and a publishing deal. You can buy tickets here. Thu 7 March, 7.30-8.30pm. AED 75. InterContinental Dubai, Festival City. I’m really looking forward debating the pros and cons of social media with Katherine Ormerod and Ty Tashiro on this panel. As expats, many of us rely on social media not just for work, but to stay in touch with friends and family overseas. But is it all good? My fourth novel, ‘I Know You’, is about a woman who’s a little naïve, a little careless about what she posts on social media, and the trouble it gets her into; I did a lot of research in order to write it. I’m generally a fan of social media for the reasons above, but I can’t stand all the showboating and fakery you see on Instagram so I can’t wait to discuss this with Katherine, whose book is called ‘Why Social Media Is Ruining Your Life’. Ty’s an expert in the science of relationships and online dating (something I’ve never done – yes, what a dinosaur!). One of his books is called ‘The Science of Why We’re Socially Awkward and Why That’s Awesome’ – as one who often hides behind the written word, I love the sound of that and will definitely be reading it before the Litfest. As social media affects so many of us, I think this will be a lively and interesting debate – come and join us! Tickets are available here. Sat 2 March, 12-1pm. AED 75. InterContinental Dubai, Festival City. This is the event every budding writer will be attending! As the winner of the inaugural Montegrappa Prize back in 2013 I’m delighted to be sharing the stage this year with my agent, Luigi Bonomi, who judges the competition, and my friend and fellow author, Karen Osman, who won the prize in 2016 and has gone on to have two books published. Before Luigi announces this year’s winners, Karen and I will be discussing with him what winners will need to do after the competition in order to turn their brilliant success into a writing career. Clue: lots of hard work! Tickets are available here. Here I am receiving the Montegrappa Prize from Luigi Bonomi (left) and Charles Nahhas (right) in 2013. Deer in the headlights, maybe, but what a feeling! I can’t wait to see who’ll win this year. Error: Error validating access token: Session has expired on Monday, 01-Apr-19 02:15:52 PDT. The current time is Sunday, 21-Apr-19 23:48:25 PDT.